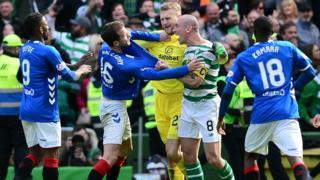 Police Scotland made six arrests during the Old Firm match, including three for sectarian breach of the peace. A force spokeswoman said a supporter was also stopped by officers for trying to get into Celtic Park under the influence of alcohol. The remaining offenders were taken into custody for resisting arrest and being drunk and incapable. Celtic won the match 2-1 to go 13 points clear at the top of the Scottish Premiership.